For more than sixty years the U.S. Military has been providing educational opportunities to it's servicemen and women. From training programs in medicine and cutting edge technologies, to tuition assistance for general college studies, the military has made post-secondary education a reality for generations of Americans. Many young people have enlisted in the Army, the Navy, the Air force and the Marines in order to take advantage of these educational opportunities. Serving in the military is a brave and honorable decision, and the benefits can be substantial. However, enlisting in any branch of the military is a serious choice, and should not be taken lightly. Military educational assistance programs require a service contract, and you will be required to serve a predetermined term in whatever branch you choose. Consider your options, tally up all of the benefits and discuss your decision with a parent or trusted adviser. If you decide the military life is right for you, here are just a few of the educational opportunities that will be open to you. We've all heard of the G.I. Bill. It is a program that, quite honestly, changed the face of the American nation by giving access to higher education to an entire generation of military veterans. The Montgomery G. I. Bill, or MGIB, continues to help American service personnel achieve their dreams of a college education. G.I. Bill benefits are available to servicemembers who have agreed to contribute $100 of their monthly service pay to their education fund. Service personnel can also contribute an additional $600 per year in exchange for increased G.I. Bill benefits available upon discharge. Ultimately, the amount of any financial aid available through the Montgomery G.I. Bill will be contingent upon time served, and the total contributions of the individual serviceman or woman. But speaking generally, after receiving an honorable discharge most veterans can take advantage of up to 36 months of education benefits, roughly $37,000 for active duty servicemembers. Reservists and members of the National Guard who have paid into the G.I. Bill will find their available financial aid total to be closer to $11,000. This money can be applied to a number of different educational opportunities, including college, vocational schools and certain specific technical training courses. Other benefits and requirements will be dependent on an individuals term of service, course study and/or reserve status. The Post 9/11 G.I. Bill, passed into law in 2009, extends and augments the benefits of the original G.I. Bill for servicemembers who were enlisted within 90 days of September 10, 2001. Providing much of the same benefits as the Montgomery G.I. Bill, it is specifically designed to financially aid military personnel who saw active duty following the events of 9/11. Particular attention is given to soldiers who have been discharged following a service related disability. The Post 9/11 G.I. Bill offers eligible servicemen and women the financial aid to cover up to 36 months of a college education. Full tuition and fees, including housing and books, will be paid for those servicemembers attending a public university. Veterans who choose to enroll in a private university can apply additional benefits through the Yellow Ribbon Program which provides up to $17,500 per academic year to offset the costs of their tuition. The Post 9/11 Bill offers financial aid for veterans pursuing an undergraduate or graduate degree, vocational or technical training, and on-the-job training programs. Benefits are also available to those veterans enrolled in correspondence classes, flight training and entrepreneurship training programs. 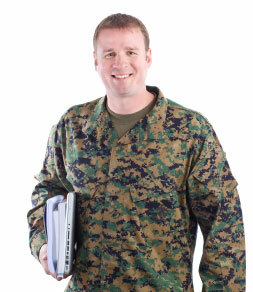 Benefits are awarded based on time served, measure of deployment, and manner of discharge. The Reserve Officers Training Corps, better known as the ROTC, offers students the chance to receive benefits to pay for college, while training to take their place as an officer in one of the branches of the U.S. Military. ROTC programs exist for each of the four major military branches; the Army, the Navy, the Marines and the Air Force. By enlisting in an ROTC program, a student agrees to take military science courses as preparation for a predetermined term of service in the military. In exchange for service, the military will pay the costs of the cadets college education including tuition, housing and books. Cadets are required to sign an enlistment agreement in which they commit to serve in the military after graduation. The ROTC is not for everybody, and it is important to understand that you are agreeing to a service contract that will require you to serve in a branch of the military for a predetermined period of time. While the ROTC program is a great way to get money for college, it is not to be entered into lightly. Armed Forces Tuition Assistance is financial aid made available to eligible servicemembers of the Army, Navy, Marine Corps, Air Force and National Guard. The TA program makes financial aid available to currently serving members of the military who are pursing a college education in their off duty hours. Each branch of the military has a Tuition Assistance program, with its own restrictions and requirements. Typically, these programs offer up $4500 in financial aid per academic year, to help defray the costs of college tuition and supplies. In the event that a Tuition Assistance program falls short of covering a students college expenses, it can be combined with the Montgomery G.I. Bill for what is called the "MGIB Top-up". Using the MGIB Top-up program will, however, reduce the amount of available G. I. Bill funds available to the servicemember after he or she has retired form military duty. Beginning as an enlistment incentive in the 1980's, the Military Student Loan Repayment Program offers students with outstanding Federal education loans the opportunity to have a portion of their loan repaid by the U.S. Military in exchange for a predetermined term of service in the Army, Navy, Air Force or Marine Corps. To take advantage of the SLRP, students must enlist for a full term of service in on of the participating branches of the military, and must have received a score of 50 or higher on the Armed Forces Qualifications Test. The amount of money available to enlistees will depend on the particular branch of the military concerned, however the Army and Navy will pay back up to $65,000 in loans for qualified applicants. Interested students should consult with a military recruiter to learn the full details of each program, and enlistees must sign up for any SLRP program at the time of enlistment. Each branch of the military offers its own financial aid or tuition assistance programs. These are commonly referred to as "kickers", and are used as an incentive to recruitment. This assistance is highly competitive and contingent upon an enlistment of at least six years in the military. Applicants must also score in the top 50% of enlistees taking the ASVAB, or Armed Services Vocational Aptitude Battery. If you meet the qualifications, the benefits can be substantial. After the Montgomery G.I. Bill or the Post 9/11 GI Bill, these college funds can increase your aid to as much as $70,000 in the Army and $50,000 in the Navy. These "kickers" are an addition to the G.I. Bill, and not a separate benefit. Further restrictions and requirements apply, but if you are prepared for the six-year commitment, this may very well be an excellent opportunity to find those much needed college funds. Enrollment in a Military Service Academy carries a lot of prestige, but it can be very difficult to gain entry. Applicants must be nominated for acceptance, and must first complete an online application detailing any and all qualifications. Not everyone can make it into a military academy, but for those that do the benefits can be great. If you should attend one of these academies, you will receive a full four-year scholarship and be commissioned as a second lieutenant in the Army, Marine Corps or Air Force or ensign in the Coast Guard or the Navy after graduation. A small stipend is also given to students at these academies. Accepted applicants to these prestigious military academies receive a full four year scholarship, as well as a monthly stipend to help cover living expenses. Upon graduation, students will take their place as a commissioned Second-Lieutenant in the Army, Navy, Air Force or Marine Corps. Financial aid for college is available from a vast number of sources, and the U.S. Military is definitely one of the most accessible and lucrative. However, it is important to speak with a recruiter and to understand any enlistment agreement fully. 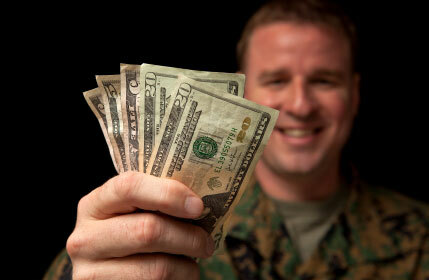 All military financial aid comes as a service contract, and you will be expected to fulfill your part of the contract. For those who are willing to serve their country through enlistment in the armed forces, military benefits can help secure the college education of their dreams.